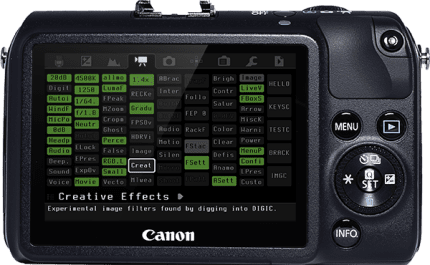 Magic Lantern is a free software add-on that runs from the SD/CF card and adds a host of new features to Canon EOS cameras that weren't included from the factory by Canon. Get the most out of your camera with the latest Magic Lantern features. Download the source code and help develop the code. Fully documented developer's API. Scripting support extends API to every day users. Tools like on-screen overlays and headphone monitoring allow you to capture footage with confidence. While most popularly known for video features, Magic Lantern provides a broad array of features for photographers as well. Analog / digital gain adjustments. Live audio monitoring through with headphones. Not available on all models - please check the feature matrix. Kelvin and push-button white balance. Auto ETTR (Expose To The Right). Exposure Lock for manual mode. Manually override exposure settings in LiveView. Quickly switch between two exposure presets. Toggle exposure simulation on/off (Liveview). Dynamic range improvements (Dual ISO, other features being researched). Zebras for under/over exposed areas. Focus peaking for quickly checking focus. Magic Zoom window to fine-tune focus. Cropmark overlays for 16x9 bars or any custom shape. Overlay a ghost image in live view. False color for precise exposure control. RGB histogram with RAW support. Waveform for perfect green screen lighting. Full control over H264 bitrate. Full control of recording framerate. Custom vignetting for lens correction. Record 14-bit uncompressed RAW video to your CF/SD card. Experimental 2.5K/3K/4K with 10/12/14-bit RAW video (uncompressed or LJ92). Bracketing for exposure, flash, or depth-of-field. Custom bulb timer for extra-long exposures. Silent pictures without shutter actuation. Record voice tags for photos / videos. Write Lua scripts in any text editor - no special setup needed! Change any ML settings from scripts (menu API). Change most Canon settings from scripts (WIP). In-camera text editor and calculator. Games (implemented as Lua scripts). 5D Mark II, 5D Mark III, 6D, 7D, 50D, 60D, 500D/T1i, 550D/T2i, 600D/T3i, 650D/T4i, 700D/T5i, 1100D/T3, EOS M.
70D, 100D/SL1, 1200D/T5, 450D/XSi, EOS M2, EOS M50. 5D3 1.3.4, 7D 2.0.6, 550D 1.1.0, EOS M 2.0.3. With GUI: 5D2, 5D3, 6D, 40D, 50D, 60D, 70D, 450D, 500D, 550D, 600D, 650D, 700D, 100D, 1000D, 1100D, 1200D, 1300D, EOS M, EOS M2. No GUI, file I/O works, still usable for porting ML: 80D, 750D, 760D, EOS M3. Very limited: 5D, 5DS, 5D4, 7D, 7D2, 400D, EOS M5, EOS M10. 5D4, 7D2, 80D, 750D, 760D, 1300D, EOS M2, 200D, 800D, 77D, 6D Mark II. EOS M3, EOS M5, EOS M6, EOS M10 (CHDK). All other models already running ML.